Nuclear Bombs have played major roles in historical events, such as World War II and the Cold War, and they are still defining history albeit in a more subdued manner. There have only been two cases in which nuclear bombs have been used. Both were in World War II and both were dropped by the United States of America onto Japan. Scientists had already known about nuclear energy since 1934, when Enrico Fermi and colleagues studied the results of bombarding uranium with neutrons. However, this nuclear energy was first developed into bombs during the Second World War as part of the Manhattan Project, which was a secret project in partnership with the USA, UK, Canada, and the Soviet Union, and under the leadership of Robert Oppenheimer. After the use of nuclear bombs in the destruction of the Japanese cities of Hiroshima and Nagasaki, their destructive powers were in high demand. This led to an arms race with every major power trying to develop its own nuclear arsenal, and many did. Today, United States, United Kingdom, France, India, Pakistan, Russia, North-Korea, and China all admit to having nuclear bombs. Some other countries are also suspected of having nuclear bombs. However, none of these countries use the bombs due to the large scale destruction and the huge levels of radiation that would be unleashed. Also, if one country does use it on another with nuclear weapons, then that country would retaliate, hence leading to an all out nuclear war. This would be mutual destruction, hence the stalemate. 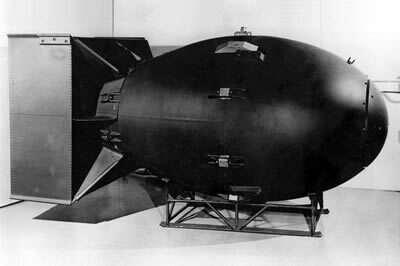 However, despite of the implications of using a nuclear bomb, how does a nuclear bomb actually work. There are actually two main types of nuclear bombs: fission bombs and fusion bombs. Fission bombs work by harnessing the energy that is released when an atom is split into two, whereas a fusion bomb works by combining two atoms into one. Both the creation of an atom and the splitting of one involves massive amounts of energy. An atom is made up of protons and neutrons, which together make up the nucleus. The nucleus is surrounded by electrons. Uranium and plutonium are two radioactive elements that have unstable nuclei which causes their radioactivity. When their nucleus splits it releases a couple of neutrons that shoot out and cause radiation. Usually, the nuclei are far apart to cause any real damage. However, when they are in close confines, such as in a bomb, these neutrons shoot into other nuclei, causing them to split and leading to chain reaction. Think of a domino effect, where one domino falls into another until all of them fall and everything is left in a mess. It is the same with the bomb, each fission releases energy and continues to do so until all of the nuclei have split, until which time, nearly everything in the area of the bomb has been destroyed. What’s worse is that even after the fission has stopped, the expended nuclei still cause massive amounts of radiation for years to come. The other type of nuclear bomb is the fusion bomb. In fusion, hydrogen atoms are heated to tremendous temperature. However, right before they are about to enter fission, they are forced to merge with other hydrogen atoms to form helium atoms. This fusion releases much more energy than fission, making this kind of bomb much more deadly and dangerous.